A tender exploration of two distinct generations of American composers in the 20th and 21st centuries, Portraits and Elegies features captivating performances by the violinist Frank Almond and the pianist Brian Zeger. From the haunting moods of Peter Lieberson’s Elegy to the eclectic but accessible dissonance of Russell Platt’s Autumn Music, this recording is a fascinating juxtaposition of contrasting musical vocabularies. Two alluring works by the gifted young composer Philip Lasser are also included (Vocalise and Berceuse Fantasque), along with some powerful character pieces from the esteemed Ned Rorem (selections from Day Music and Night Music). This CD is the premiere recording for both the Lieberson and Platt compositions, and also is the first commercial recording ever of the “ex-Lipinski” Stradivarius violin from 1715, a legendary instrument that only recently returned to public performance. Well known for their exemplary work in a wide variety of genres, Almond and Zeger form a perfect musical balance to emphasize the specific characteristics and appeal of each work. Although certainly a display of both players’ outstanding musicianship and virtuosity, the CD also shows a faithful dedication to each composer, along with a decidedly lyrical and melodic feel that will reward any listener. Violinist Frank Almond holds the Charles and Marie Caestecker Concertmaster Chair at the Milwaukee Symphony Orchestra. He returned to the MSO after holding positions as Concertmaster of the Rotterdam Philharmonic with Valery Gergiev, and Guest Concertmaster of the London Philharmonic with Kurt Masur. In addition to his orchestral work he continues an active schedule of solo and chamber music performances in the US and abroad and is also the Artistic Director of the Frankly Music Series. Pianist Brian Zeger has built a distinguished career not only as a pianist, but also as an ensemble performer par excellence, artistic administrator and educator. In addition to performing chamber music and as a soloist, he is the frequent recital partner to leading vocal artists such as Deborah Voigt and Susan Graham. He is also the Artistic Director of the Department of Vocal Arts at The Juilliard School and the Executive Director of the Metropolitan Opera Lindemann Young Artist Development Program. Almond and pianist Brian Zeger offer uncommonly beautiful music by four American composers on this disc. French influence shimmers in Philip Lasser’s Vocalise is lovely in the way of Fauré’s music. His Berceuse Fantasque, a psychological study of rare depth and insight, begins with a lilting waltz of a lullabye and devolves into a restless, surreal nightmare. Overall, the compilation and performance capture deeply considered poetic reflection. Almond and Zeger perform with unerring taste, spontaneous freshness and highly evolved, expressive sensitivity. The violin Almond plays, the ex-Lipinski Stradivarius, records with incredible richness, displaying a dazzling spectrum of colors. This marks its commercial recording debut. The curatorial choice of literature makes a case for substantial, sophisticated new music firmly rooted in romantic traditions. In this it succeeds handsomely. "... [V]iolinist Frank Almond and pianist Brian Zeger [are] two artists whose sensitivity and attention to tone are perfectly suited to this program. Almond, who plays here on the ex-Lipinksi Stradivari violin (the instrument's first commercial recording), produces an amazingly sweet, rich tone even in the highest registers called for in Lieberson's Elegy. Zeger's voicing and controlled use of the pedal and dynamics provide a sensual backdrop for Almond's playing, and the two musicians play off one another with delicacy and brilliant technical accuracy. Innova's clean but rich sound quality enhances the detail that Almond and Zeger bring to this highly enjoyable performance." 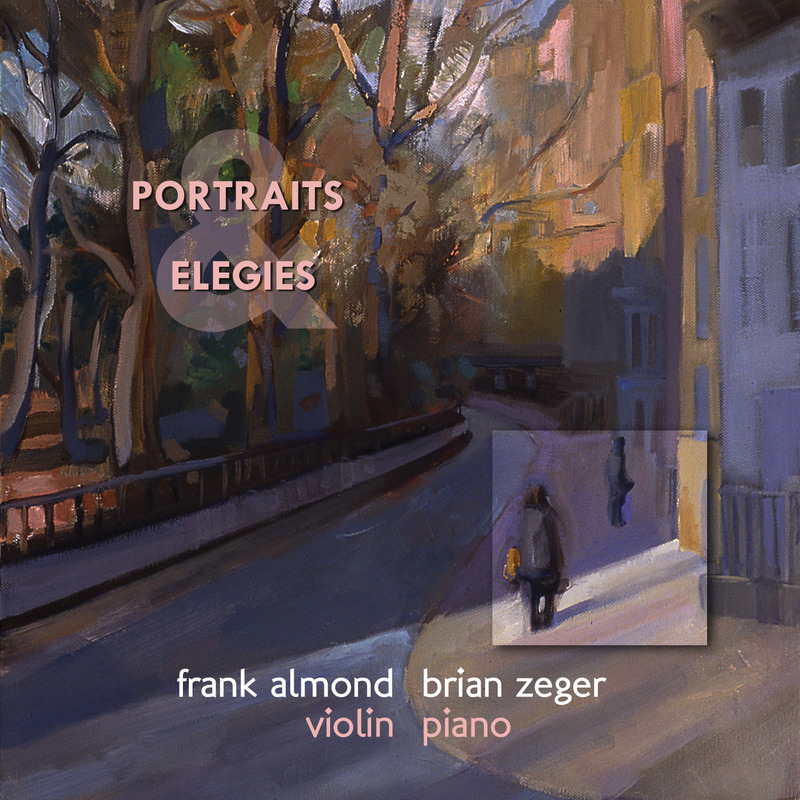 Portraits, Elegies ” (Innova 763) featuring Frank Almond, violin and Brian Zeger, piano is a definite must hear for the beauty of the selections and the mastery of the performances. Frank Almond is the concertmaster of the Milwaukee Symphony, formerly of the Rotterdam Philharmonic and the London Philharmonic. Possessed of a rich, beautiful sound, Almond is a wonderful player and seems to have a real connection the pieces on this program. Brian Zeger is one of the nation’s best known accompanists and chamber musicians. He is also the artistic director of the vocal arts department at Julliard. This whole album is devoted to music that is reflective, pensive, melancholic; at times, sad and captivating throughout. The ” Vocalise ” (1999) by Philip Lasser was written in homage to Rachmaninov and is quite reminscent of the piece of the same title. The version heard here later became the center movement of Lasser’s symphony, “Circle of Dreams”. Lasser’s ” Berceuse Fantasque ” is a lullaby, representing a song sung to a child and the dreams encountered by the child as well as the singer. The result is almost psychological, alternating between the peaceful and the restless, much as dreams do. The selections from ” Day Music ” and ” Night Music ” by Ned Rorem are well chosen. Some are plaintive, subdued and tranquil; others, highly energetic and virtuostic show pieces. Highlights include the very French sounding ” Extreme Leisure ” and the ” Billet doux “, Rorem having a near life long affinity for and expertise in French music. The ‘driving’ side of the Rorem selections is typified by ” Gnats ” and ” Bats “, both propelled forward by some very edgy, jazz-like rhythms. The Peter Lieberson ” Elegy ” (1990) is characterized by a haunting melody in the upper register and some dark, sad arpeggiations in the piano. The melody and its fragments give way to a waltz-like coda that practically dissolves and ebbs away. ” Autumn Music ” (2007) by Russell Platt, is comprised of the last two movements of a sonata written for Almond and Zeger. Basically, this is a fantasia and chaconne and the entire piece is somewhat subdued, mysterious and a bit unsettling. Overall, this is a beautiful and haunting collection, beautifully played. Frank Almond is a wonderful player who, hopefully, will become better known nationally and I am personally motivated to find out more about Philip Lasser.